Bitcoin price is set to end a 6-month red candle losing streak today if the bulls can maintain a price above $3420. After a sharp $150 (4%) decline and subsequent sharp reversal, we take a look at the charts to try and get the lay of the land before the close. Bitcoin price 00 opened the month at $3360 and managed to reach towards $4200 last week before suffering a setback on Sunday where the bears managed to take control while the bulls were taking profits and pushed BTC price back towards $3700. The monthly chart shows that the bulls have managed to control the price action for the month, with there being more demand than supply in the low $3000s where the 50-week moving average lies as initial support, as it did during January 2015 after the 85% decline. The MAC-D, which is calculated by subtracting the 26-period Exponential Moving Average (EMA) from the 12-period EMA, is still trending down and has some way to go before crossing above the signal (9-day EMA) and baselines to indicate that there is a longer-term shift in the market. However, there is the first sign of the MAC-D histogram printing indicating declining bearish momentum. The histogram serves to show the distance between the MAC-D and the signal line and as such, when it is in decline, it illustrates that there is some movement towards a bullish cross of the two. Although this is a good sign, there is some way to go. The daily chart shows a conflicting picture. 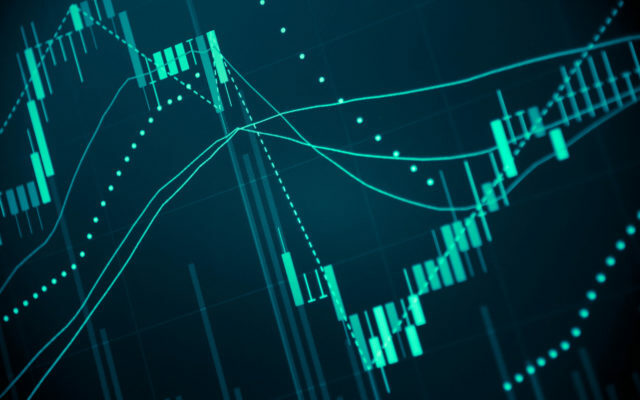 The drop from $4200 has been supported, initially by the 100-day moving average and following an aggressive dump overnight to $3658, quickly reversed off the 61.8% retracement, forming a pin bar reversal candle on the daily, which is bullish. Having said that, the MAC-d has crossed its signal line bearish (but above the baseline) and there is some minor bearish divergence on the CMF. The combination of these two technical aspects has traders at odds more so than usual as to the direction of travel expected. 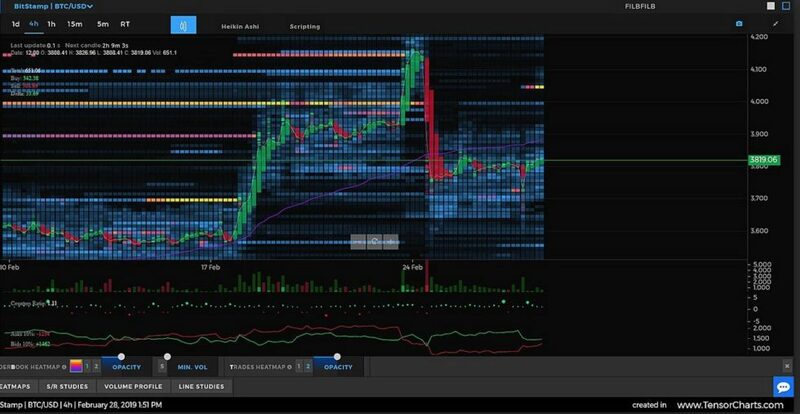 Looking at the order flow charts as provided by Tensor Charts, we are able to visualize where there may be areas of support or resistance based on volume density and size of orders for a given price range. As illustrated by the colored blocks, we can see that at Bitstamp, there is a cluster of support below the current price of $3819, which will serve to somewhat support the bullish case. But the darker yellow areas above price illustrate that there are large sell orders already placed around $4050, which will serve as some resistance and will require strong bullish momentum at the top of the move to break through. We can see how this occurred last time the bulls knocked at the door of $3700 and $4000 and subsequently became a block too far for the bulls at $4200. The chart also serves to illustrate that Bids within 10 percent of the price range, exceed those of the Asks, which at face value, would indicate that there is more buying interest than selling interest at these prices. It is likely that there will be a bullish or bearish move as we move into the Monthly candle close and the current bulls vs. bears battle will be settled before the end of the week. The post Bitcoin Price Analysis: Bulls Look to Retest $4200 Into the Monthly Close appeared first on Bitcoinist.com.